Three Fourths Home is a visual novel about family, circumstance and remorse. Kelly has recently moved back to Nebraska to her parent's house after a difficult time away. Kelly finds an interesting looking guitar pic on the floor. She is at a now dilapidated building, one important to her family, and it begins to rain. Getting in her car she begins the journey home. After this brief introduction you are told to drive. Holding down right trigger accelerates. As the weather gets worse your worried mother phones you, surrounded by your family, and the story begins. The presentation in Three Fourths Home is immediately striking. A minimalist and clean theme runs from the opening menu through to the ending credits. 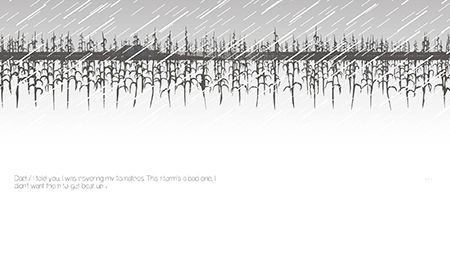 The top half of the screen shows the car driving past the Nebraska fields and the bottom shows the dialogue. You get a number of choices for each reply you can give. They don't have huge differences in content; rather, it's the tone that you consider. You can be more sympathetic, take sides or just get to the point. Its about how you want to act, which has consequence as you play through. There are wonderfully subtle touches in the game. The sound of rain, tyres along the road and lightning is ever present, changing in volume and density to reflect the current tone of conversation. You'll notice passing areas that are brought up in conversation; asked where you are you reply “at the wind farm” as the numerous turbines start to pass you by. It makes the situation feel all the more real. My only complaint was that pressing right trigger down for thirty minutes was a bit of a distraction, though there were times where I was so engrossed I practically forgot that I was. Three Fourths Home is a triumph. Its melancholy presentation, from the tone of the conversation, the ever invading diegetic sounds and the clean visuals focus your attention on the topics it discusses. The quality of writing will make you care about the family and their troubles and you'll consider each sentence you chose to reply with. Especially after you encounter the hard hitting conclusion. While this may not convert people that have a strong dislike for visual novels, Three Fourths Home is a must play for anyone who enjoys strong narratives and grounded conversation focused games. You can buy it for £1.99 (normally £2.49) from the Humble store which comes with the soundtrack.